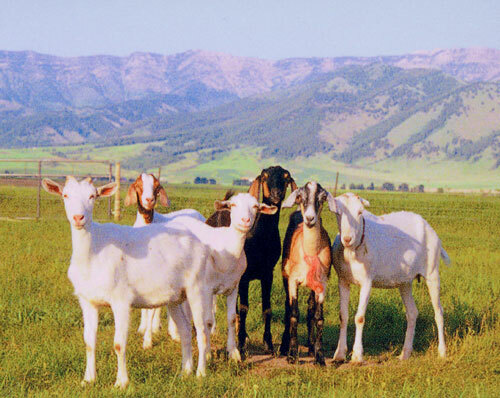 Goats on the Amaltheia organic dairy in the foothills of the Bridger Range produce milk that is turned into gourmet cheese. Amaltheia Organic Dairy had humble beginnings, but has become a major local cheese producer. They started out with only 90 goats in their inception in 2000, but now have over 280 goats that produce 150 gallons of milk every day. This dramatic growth has been a product of careful development and quality cheese. Tucked in at the base of the Bridger Mountains, the dairy was founded by Melvyn and Sue Brown on Thanksgiving Day in 2000, where they started milking their 90 goats. Their main client base was gourmet cheese consumers in California, but that was quick to change. As they grew, their sustainable goals became realized. In 2005, they received their organic status through the Montana Department of Agriculture and the U.S. Department of Agriculture. Also in 2005, they started selling organic manure to local gardeners and shops. In 2008, they received an Ecostar Award for their efforts to become a completely sustainable farm. The Browns have made the dairy a family tradition, with their son Nathan and daughter Sarah also help maintain the goats. Other family members help out as well, keeping the dairy in the family. The cheese that has made them such a success is not easy to produce. It takes five pounds of goat milk to produce one pound of cheese, and each batch of cheese requires constant attention. Their most popular cheese, Chevre, takes about three days to fully develop, with other cheeses taking just about as long. The name of the dairy is certainly unique, and traces its origins back to Greek mythology. Amaltheia was the goat that nursed Zeus as a child, and was therefore rewarded by being put into the sky as a constellation by Zeus. Her image represents abundance.